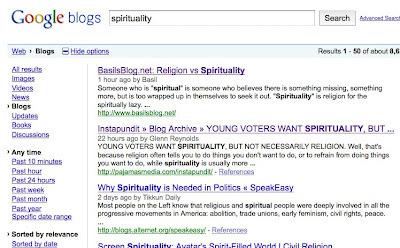 Earlier tonight, I wrote a post about Religion vs Spirituality. Visitor logs (yes, I know when you're here) showed that someone came here by doing a Google blog search on "spirituality." At the time, this blog was the top search result. Above Instapundit. Who I quoted in my post. Now, does this mean that I've Instapundited Instapundit? Or does Google just like me better? Heck, I don't care. I'll take it. I'm a Google-whore if there ever was one. Can you still do that link through stuff? I need that post again, so I can start linking the leftie sites again. W00t! Do not be surprised if you get some weird links, now. Basil, I'm with ya'. The Gooble loves me, and I can't get enough of it. Funny how that stuff works, huh? Andy: you pwn teh Google!